If you’ve been following this blog, you know that I hate relying on one type of search engine. In this post, I’m going to discuss some of the new search engines that I’ve come across (new at least for me). Yippy used to be Clusty and one of this metasearch engine’s “hooks” is that it creates “clouds” or clusters of related search topics that can spark your thinking. 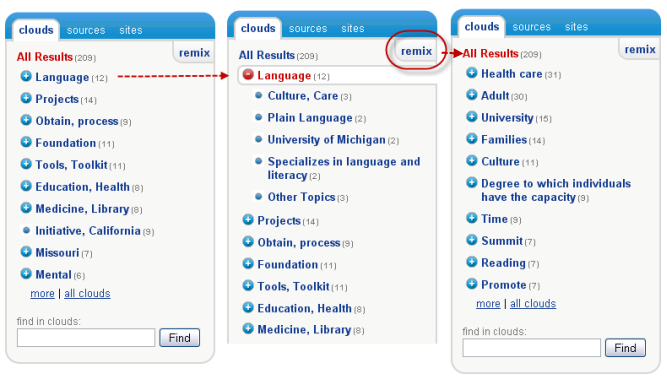 The default is ten clouds (a number you can change) but you can always choose to remix a cloud. 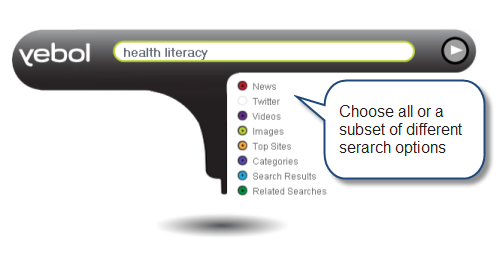 The figure below shows the clouds displayed when using “health literacy” as a search term. 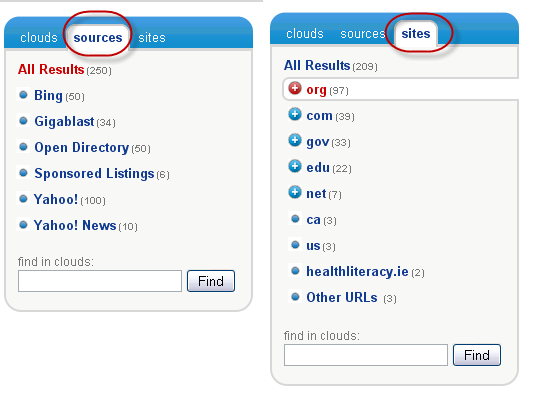 You can also identify the sources and sites being searched and restrict your results based on these filters. For example, if you’re doing a health-related search, you might want to exclude .com sites. Registering for a Yippy account allows you to avail yourself of more features including video conferencing, a web-based email service, and other cloud-based options. Carrot2 also uses the idea of clustering as a paradigm, providing you with a text view of the clusters that arise as you search as well as access to a visualization tool. 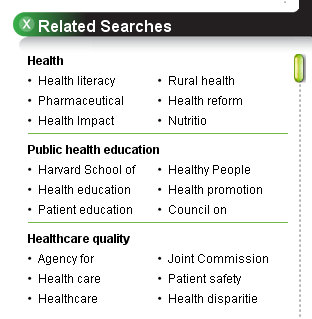 The figure below shows the clusters from a “health literacy” search using this search engine. Carrot2 makes its source code available so that users can use it to cluster documents and other data sources in addition to creating a search engine. You can learn more about this open-source framework here. Yebol has a unique interface design that you can control based on your preferences. Results are displayed in an organized fashion which you can also control if you want to focus on one or a few data sources. Although Yebol doesn’t display data clusters it will display related searches. You can learn more about Yebol here. Sputtr also offers a different sort of interface. Clicking on the media type reveals search results by category. 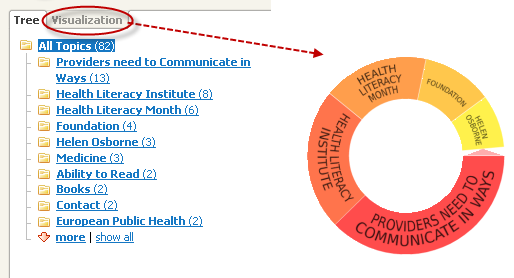 For example, I can see Tweets relating to health literacy by clicking on the “Social” tab. Sputtr allows you to fluidly toggle between different media types as you research a topic. The last tool I’d like to mention is in a class by itself. SlideFinder is a search engine devoted to slide presentations and allows you to quickly visualize your search results. You can learn more about SlideFinder here. How do these tools stack up against Google and Bing? The top tier results are generally the same but there are some differences and if you’re doing any sort of thorough research project, you might be interested in these differences. Additionally, clustering functions and different ways of presenting data can lead you to rethink your research approaches. 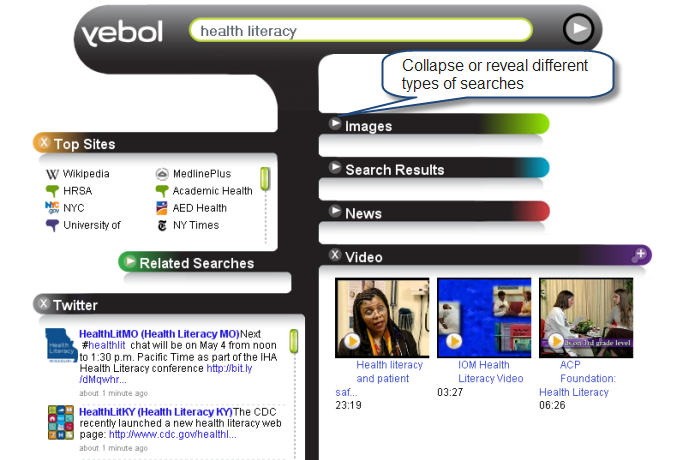 You can find a Symbaloo collection of search engines here (these include some useful medicine-related search engines). This entry was posted in elearning tools, instructional design approaches, search engine visualization, search engines and tagged Ambiently, blekko, carrot2, clustering data, clustering search engines, clusty, e-learning tools, Education Eye, elearning tools, health literacy searches, health search engines, medical search engines, research databases, research tools, search engine resources, search engines, slide finder, sputtr, Symballoo, Talkminder, web 2.0, web2.0, yebol, yippy. Bookmark the permalink.